Seattle’s cruise terminal at Pier 91 serves as homeport for Carnival Line, Celebrity Cruises, Holland America Line, Princess Cruises and Royal Caribbean. Located at the north end of Seattle’s waterfront on historic Smith Cove, it’s just 10 minutes from the city’s retail core and famous Space Needle. Check-in for your flight home while onboard your ship. 1,000 secure parking spaces with complimentary shuttle to terminal; oversize vehicles and RVs welcome. Wheel chairs and other mobility devices on site. Rental car kiosk on site. 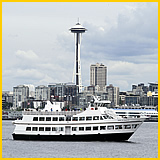 The Bell Street Pier Cruise Terminal at Pier 66 is conveniently located along Seattle’s downtown waterfront. This vibrant pier is home to Norwegian Cruise Line and Oceania Cruises. Ample parking garage directly across the street offers secure parking and a complimentary shuttle.